Created for Comfort, Beauty, and Innovation. An extremely comfortable and useful close contact saddle. Well suited for riders interested in equitation, hunters and jumpers. 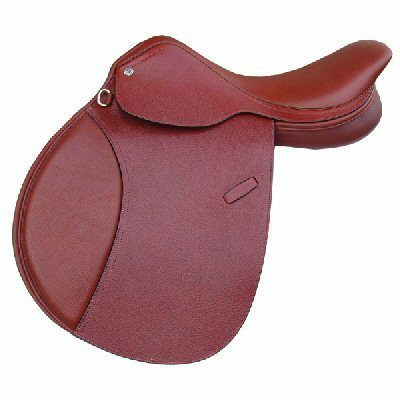 This is a saddle that will suit the individual who prefers not to ride with a dramatically shortened stirrup leather or one who has a longer leg. A fabulous saddle for the money. Saint Lourdes designs are unique to the industry. Built on a specially treated spring tree to prevent moisture absorption and ensure stability and durability while remaining flexible. The finest hides from their own tannery are individually selected and tanned utilizing an innovative system that protects against drying and cracking and includes antibacterial and antifungal treatment that adds years to the life of your investment. A collection designed by a horseman for horsemen; of the highest quality materials and premium leathers to make the finest products. Special offer for limited time only! All saddles include matching stirrup leathers and peacock safety stirrups. A value of over $100.00! !